From Golu-hopping to dancing at Garbas, Navaratri festivals are infused with a social component: a wonderful opportunity for friends and families to come together and honor Durga, and celebrate one another while doing so. The spirit of this celebration, both devotional and familial, was truly encompassed by 'Devi - An ode to Goddess' at the Shirdi Sai Parivaar in Milpitas, CA, on September 23, 2017. The evening started with a musical performance by Aks and Lakshmi of Eclipse Nirvana. They are a composer-vocalist (and husband and wife) duo who bring a modern take to traditional, spiritual compositions. Their music was a fusion of several styles, and they began with "Sur niragas ho" in praise of Lord Ganesha. During the first piece, the softness in Aks' voice combined with the richness in Lakshmi's set the tone for how they would complement each other throughout. They next performed the "Abhirami Stotram," where both exhibited their vocal range and excellent control over their voices, especially when hitting the higher notes. However, what was most apparent was the sanctity of their rendition. From explaining the history and significance of the composition before they began, to both of them smiling brightly, to Lakshmi closing her eyes and placing her hand at her heart in reverence while singing "Namostute," the devotion was palpable to everyone present. While the arrangement had several modern elements and the interludes demonstrated their flair with various styles of music, it was obvious that the intended spirituality of the piece was not compromised. In the "Margabandhu Stotram" and the "Bhagavati Stotram," there were several instances where their voices blended beautifully as one. The two voices coming together in lower ranges heightened the power of the pieces. They finished with the "Durga Pancharatnam." The orchestral backing and the video with their family singing in the background was a fitting finale to a captivating ensemble. Their soothing voices, creative fusion, and authentic enjoyment served as a welcoming opening for the evening ahead. Following this contemporary devotional segment was Talavadyam by the students of Srinath Bala, who also happens to be the maternal uncle of Aks! Shivaram Viswanathan, Anirudh Rao, Tarun Dinesh, and Ambika Ramadurai played mridangam while Shraddha Srinath (daughter of Srinath Bala) played the ganjira and konnakol. The students had only been learning for one year, and the unity and precision was stunning. The rhythm was maintained whether the mridangists picked up where another left off, or played in unison. And to tie it all together, Shraddha Srinath alternated between the ganjira and chanting in her resounding voice.The back and forth between students and teacher was delightful; from the youngest to the oldest on stage, each oozed confidence, and their teacher followed with a steady taalam from the center of the audience. After the high energy Talavadyam, the music segued into accompaniment for the dancers. We continued to see the recurring theme of family on stage as the sisters of Srinath Bala and Aks took the stage as dancers. 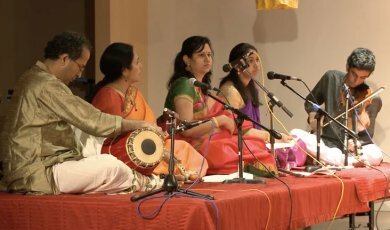 Mother-daughter duo Shoba Subramanian and Aishwarya Subramanian were joined by brother/uncle Srinath Bala on mridangam. Vikram Shivakumar, student of Sandhya Srinath (Srinath Bala's wife) played the violin and Shraddha Srinath and Savita Rao (Sandhya Srinath's sister) were the vocalists for the evening. Joining them on nattuvangam was Jayanthi Balachandran. As the dancers ascended the stage, it was clear that this artistic family intended to share their love of the arts to the audience present. The dancers began with a Pusphanjali in Revathi ragam and khanda chapu, composed by Srinath Bala. Shoba Subramanian and Aishwarya Subramanian were a treat to watch together. Their attention to detail and the focus on the beat was impeccable. They maintained perfect symmetry and the deliberateness in their eye and eyebrow movements was testament to their years of practice. As they transitioned into the "Saraswati Namastubyam" shloka, they depicted Saraswati sitting in her lotus with poise and grace. Shoba's experience shined through in her enthusiasm on stage, and Aishwarya's strength was the subtlety apparent in her every step. It was not at all obvious that it was Shraddha Srinath's first time accompanying a live dance recital, as her voice was unwaveringly powerful. Savita Rao's melodious voice effortlessly carried throughout the hall, in conjunction with Vikram Shivakumar's lilting tunes. Jayanthi Balachandran's nattuvangam was crisp and sustained throughout, in perfect coordination with mridangist/composer Srinath Bala. 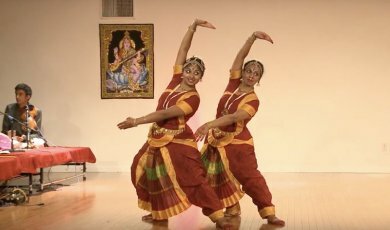 Next the dancing duo presented "Amma Aananda Daayini," a varnam in Ghambiranaatai ragam, and adi talam, composed by the late Dr. Balamuralikrishna. Aishwarya performed the poorvanga while her mother took over as nattuvanaar, and they reversed roles for the uttaranga. In her turn as dancer, Aishwarya's dancing appeared effortless and she transitioned between the soft and angry facets of Durga with ease, displaying control and agility in her nritta. When Shoba took the stage as dancer, the confidence was striking. Her alacrity in the gudittu-mettu adavus and the speed at which she executed the nritta was astounding to watch, but it was her immersion in the abhinaya that was absolutely mesmerizing. The duo finished the piece on stage together, in another memorable pose as Durga sitting on her tiger. Dressed in their red costumes, accompanied by a stellar orchestra, and glowing from the adrenaline that was surely pumping through them, they were a brilliant portrayal of the Shakthi that Navaratri honors. Rasya Chopalli then showcased an 'Ashtarasa Shloka' from the Soundarya Lahari. The different rasas were highlighted by Savita Rao and Shraddha Srinath alternating in singing each verse. Rasya carefully depicted the nuances of each emotion through her eyes and actions, essaying the role of Parvati noticing the various aspects of Shiva. The penultimate piece was the "Annapoorni Visalakshi" keerthanam, which began with a virutham in Brindavani ragam performed by Shravya Srinath (Srinath Bala's younger daughter) and Ananya Rao (Savita Rao's daughter). The mother-daughter duo then transported the audience into the magnanimity of Annapoorni, particularly through Shoba's affection while portraying the goddess serving food. They closed the evening with a rigorous thani-avartanam composed by Srinath Bala. Shoba Subramanian and Aishwarya Subramanian embodied Ardhanareeshwara, and began by dancing separately. While they were separate on stage, Jayanthi Balachandran and Srinath Bala also rendered the konnakol and mridangam separately. However, as the piece progressed, the dancers came together as one, as did the percussionists, finishing with a total unification, symbolizing one all-pervasive energy. 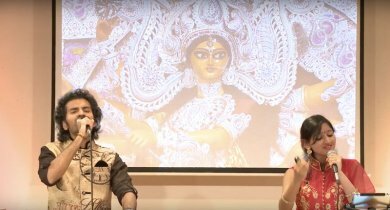 The artists of 'Devi - An ode to Goddess' managed to project the full spirit of Navaratri through the glory of the supreme goddess and the power of family and friends. Ranjani Iyer has learned from several teachers and hopes to combine those lessons with her personal experiences to cultivate a multifaceted perspective, both artistic and academic. She is interested in technology and language, and strives to understand the intersection of her passions.